Players can’t produce if they’re unable to play, so coaches and players should do everything in their power to prevent injury. That starts with basic safety measures, such as ensuring playable surfaces (dry, free of debris, holes, bumps, etc. ), bleachers a safe distance from the floor and padding on walls near baselines. In venues that don’t accommodate, coaches and players should at least be aware of the dangers and adjust accordingly. Coaches also can talk to referees about paying extra attention to player safety in those surroundings, and players can help matters by curtailing overly physical play. Have the players get a ball and a partner. The player with the ball will dribble towards the defender but before they are too close to the defender, they will change the ball from one hand to the other. Right after changing hands, the player will drop and give jab step that will push them in the opposite direction past the defender. Make sure to work on it with both hands and changes roles with the partner. Have the players start with a ball on the baseline. The players will take two fast dribbles forward with the right hand. After running for two dribbles, the players will make a hard stop by stopping with their right hand making a hard dribble at the same time as their foot making a hard step to stop. Make sure to work on this to both sides. Have the players start with a ball and get into 3 lines at the top. 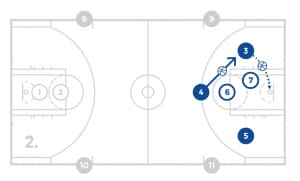 The first player in each line will take two hard fast dribbles forward with the right hand. After running for two dribbles, the players will make a quick stop by stopping with their right hand making a hard dribble at the same time as their foot making a hard step to stop. They will then take a shot, get their rebound and move to the back of the line. If fronted flash is an offensive concept that requires the players to recognize how the defense is playing against a post player. If the defensive is fronted the post player on the block, the offense must recognize this and take away any help defenders by having the player whose defender is helping, flash to the high post. By flashing to the high post, their defender must decide if they will continue to help on the low post player or come up to guard their player at the high post. Upon catching at the high post, the offensive player will read the defense to either shoot, drive, or make the high low pass. The high low pass gets its name because it is a pass from the high post to the low post. The high low pass is often a lob pass that goes over the low post defender with nice touch so the offensive player can catch and score. Have the coach start on the wing and a post player and defender on the ball side block with a line on the opposite block. 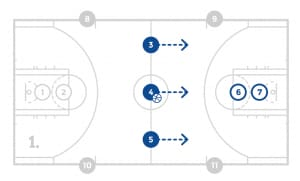 Everyone in the line can have a ball and the first person will start by passing the ball to the coach on the wing across from them. The coach will look into the post where the defender will be fronting the offensive player. That helps the player on the opposite block know to flash to the high post for the ball. The coach will pass the ball to the high post and that player will make a high low pass into the post player who will finish. 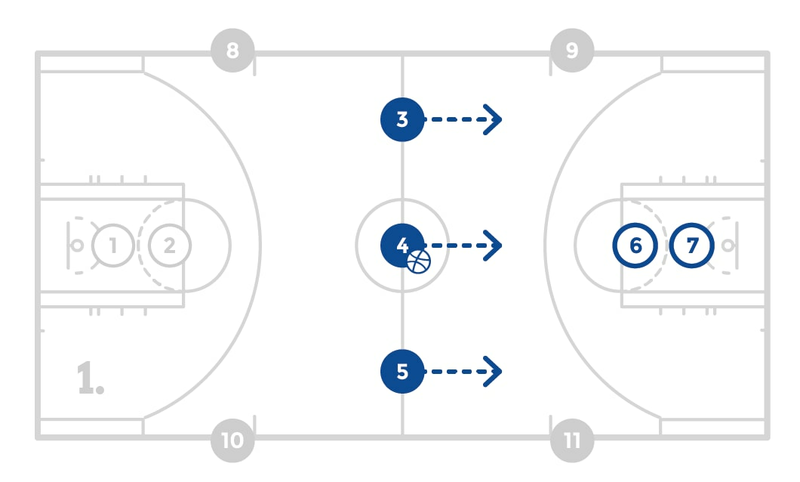 The player who flashed will become the defender on the block, the defender will become the offensive player on the block and the offensive player will go to the back of the line. Repeat this process for the allotted number of reps.
Have 2 lines, 1 on the elbow and one on the same side wing. The players on the elbow will have a ball and toss it to the coach at the top. The player at the elbow will go set a screen for the player on the wing. The player on the wing will curl hard assuming that their defender is going over top. The screener will assume that his defender must help on the curl and pop back to the ball. The coach will pass the screener the ball who will shoot the designated shot. The players will switch lines and continue the process. Continue until the allotted number of shots has been made and then switch sides. 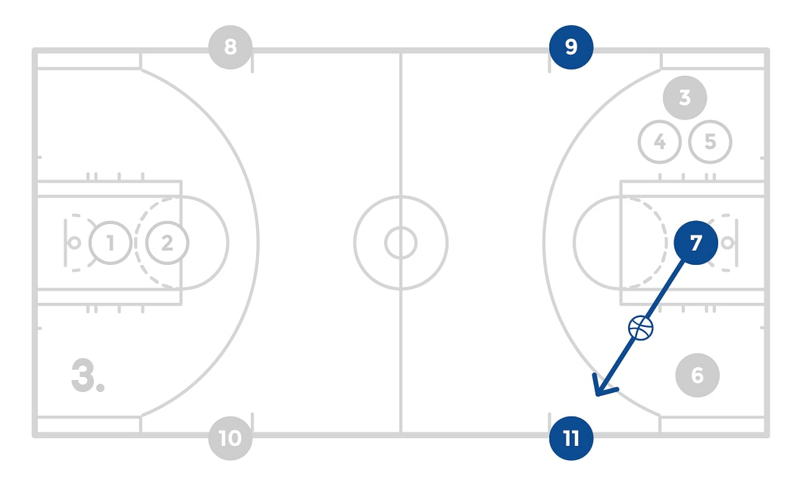 This drill is the 11-person transition drill because there must be at least 11 players to make it work. There are 2 defenders at each basket and there are 3 offensive players going towards 1 basket which is 7 players. The remaining four spots are on the sideline on in between half court and the free throw line on each side of the court where a player could receive an outlet pass. With these four spots filled, there are 11 players needed. The players will move towards a basket in a 3 on 2 break. After 1 shot or a turnover, what ever player gets the ball (offense or defense) will make an outlet pass to one of the players on the sidelines. 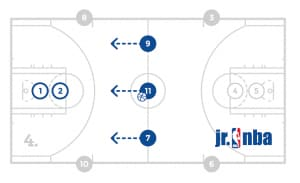 After the outlet the player will dribble to the middle of the floor and the player who made the outlet will fill the lane that they passed it to and the other player on the sideline will fill the opposite lane. These 3 players will attack 3 on 2. After a shot or turnover, any player can get the ball and repeat the process going back. The two defensive players will step off and two of the offensive players will become defense while the other players will fill in the outlet lines. Continue this transition process for the allotted amount of time. 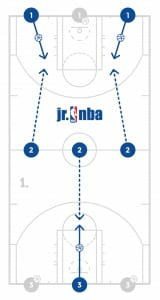 Have the players partner up and have 2 teams start on offense and defense on the blocks. 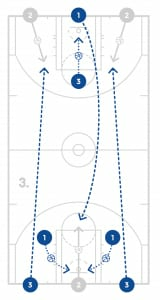 The coach will start with the ball on the wing and the player on the ball side wing will set a cross screen for the other big. The defensive players aren’t allowed to switch and when the coach passes the ball into the post, the game is live. After the possession, the defense will go to offense and the offense will rotate off as a new team comes on defense. Play to the designated score. 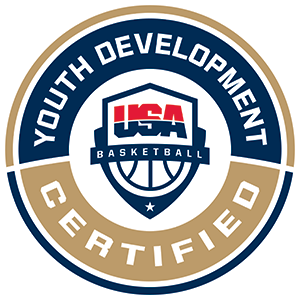 Have the coach start on the wing and a post player and defender on the ball side block with an offensive and defensive player on the opposite block. All the other players will be partner up and rotate in offense to defense and defense off. The ball will start with the coach on the wing. At that time, the player on the opposite block will know to flash to the high post for the ball. 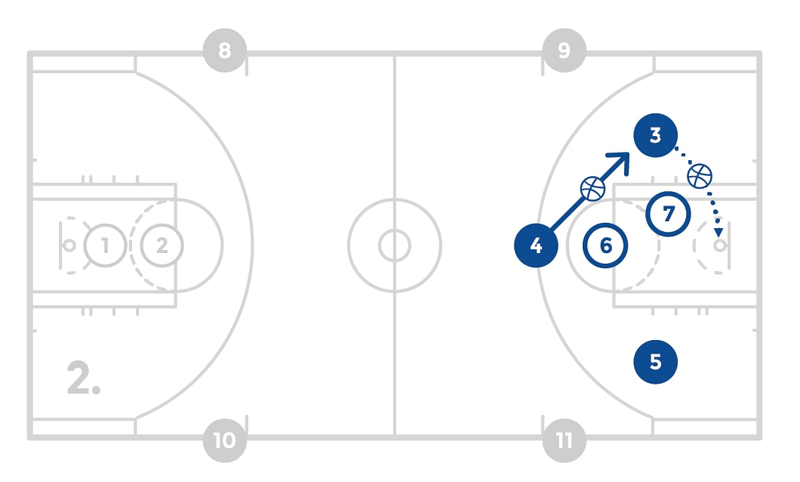 The coach will pass the ball to the high post and the game becomes live for one possession. After the shot or turnover, the players will rotate. Place 5 markers on the perimeter and have a balanced line of players behind each one. 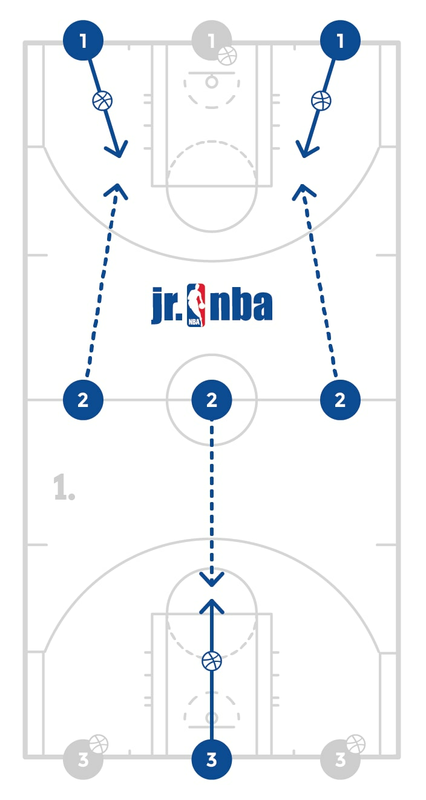 The first 5 players up will pass and cut or pass and always fill the open spot on the court when a player leaves it. Encourage the players to work together to move the ball quickly and find and fill the open spots. After 5 controlled passes, the ball becomes live and the players can do anything offensively to take a shot. After the shot, the group will get their rebound and go to the back of the lines and the next 5 players will step on and repeat the process. Utilize as many baskets as possible and have 1 player shooting at a time per basket. Each player will shoot 5 straight free throws until all players have shot. After all players have taken 5 free throws, the player with the highest score wins. The maximum number of points a player can score is 25 points or 5 points per shot. 5 If the player makes the shot nothing but net and the ball is coming back toward the free throw line so that the player can grab the ball with 1 foot still touching the free throw line, the player is awarded 5 points. 4 If the player makes the shot nothing but net and the ball does not come back toward the free throw line and they cannot grab the ball with 1 foot still touching the free throw line, the player is awarded get 4 points. 3 If the player makes the shot but the ball makes contact with the rim (or backboard) 1 time, the player is awarded 3 points. 2 If the player makes the shot but the ball makes contact with the rim (or backboard) 2 times, the player is awarded 2 points. 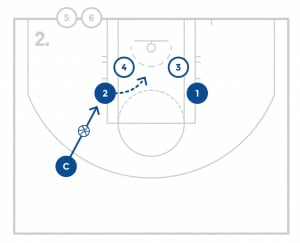 1 If the player makes the shot but the ball makes contact with the rim (or backboard) 3 times or rolls around on the rim, the player is awarded 1 point. 0 If the player misses the shot, they are awarded 0 points. Have a coach or other players count their points after every shot for 5 shots. 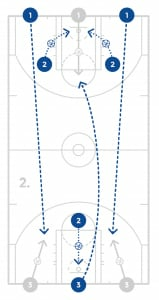 This drill teaches the players to be extremely focused on their free throws. Often players will make the shot but will be frustrated with their score. The scoring system also allows them to set goals and beat their record.